Have you noticed cracks in your foundation walls, bowing walls, or any other signs of potential foundation disrepair? Your home's foundation is a crucial part of your home's security, so getting problems solved quickly is key. With 25 years of experience in the foundation industry, MidAmerica Basement Systems is uniquely qualified to help. All of our patented foundation repair solutions are custom designed for your home. We have been recognized by Supportworks for our use of their products and techniques, and we have won awards for our skills in installing PowerBrace™ Systems and CarbonArmor® products which greatly benefit your Quad Cities home. If you're ready to get started on foundation repair solutions, call in the experts at MidAmerica Basement Systems for a free inspection and estimate! Craig of Morton, IL met with design specialist Dan Garner from MidAmerica Basement Systems after he called the company with concerns about his bowing walls. Dan helped Craig determine the best solution for his problem. Dan suggested CarbonArmor, a stabilizing product made of carbon fiber. Craig's wall is now stable, so he's resting easy! You don't have to live with stressful foundation problems. MidAmerica Basement Systems will conduct a thorough inspection of your home, and we'll let you know exactly what steps need to be taken to permanently stabilize your foundation -- restoring value to your greatest investment. 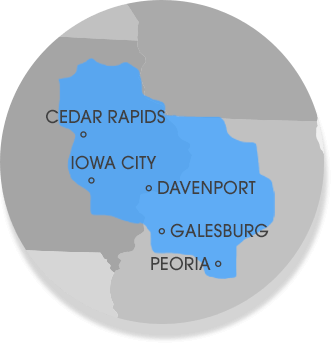 Contact us today to request your free foundation repair estimate in Normal, Iowa City, Dubuque, Rock Island, Clinton, Moline, East Peoria or nearby.